Each year, members of the Modern Woodmen of America recognize the work of individuals in their community who are dedicated to serving others, and make a donation to a charity of the honored person’s choice. 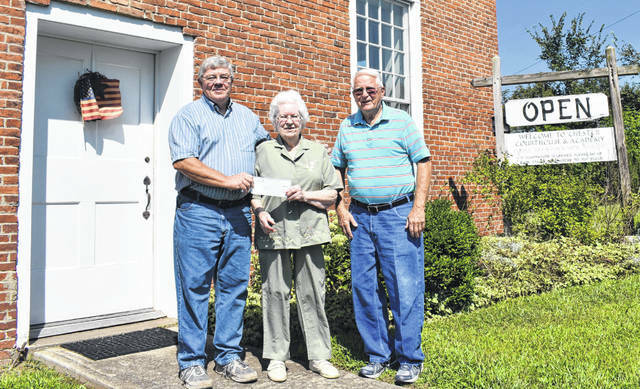 This year, Meigs County Chapter 7230 in Burlingham chose to honor King for her work during a surprise picnic in her honor; she named Chester Shade Historical Association as the recipient of the donation. Her definition of “old” is to be ill tempered, possessive, complaining, not wanting to do anything. She remembers hearing her aunt saying to her children that when she got old, if she ever got “cranky” they should tell her to stop. Her aunt was over 90 years old at the time, and King said that statement has remained with her throughout her life. King worked alongside her husband on their farm, had six children, retired as a bus driver in 1993 after 25 years on the job, and began another career quilting. She cared for her aging parents for 12 years and her mother-in law for five. Now she is crocheting, and relates her story of how she learned the skill. When King developed breast cancer three years ago, she stayed with her daughter Grace King Scott in Marion, Ohio, while taking treatments at James Cancer Center in Columbus. Resolved to “keep busy, I can’t just sit here,” her daughter took her to visit the nearby retirement center where volunteers were crocheting hats. This cancer survivor has made hats 165 that have gone to James Cancer Center and 300 to other groups. As King spends her winter in Florida, she said she will continue making hats, and has plenty of yarn thanks to her family.